As the smartphone penetration expands in rural India, Google is hoping to piggyback on it to help the children with their reading skills. The company on Wednesday unveiled its new Bolo Android app that is a speech-based reading-tutor app aimed at rural kids, who would otherwise may not have access to a good education support system. Being released in India first, the Bolo app is now available for free via Google Play and can work offline. There is no word on when the app will be released in other markets. The government-back school system in most Indian states leaves a lot to be desired and it is often the only available avenue for getting an education in rural areas as well as for children from financially struggling families. Google is hoping to change that by using smartphones, which are increasingly becoming a common sight, even in rural areas. “We believe technology has the power to help transform teaching and learning, and have been actively directing our products, programs and philanthropy to ensure that all students are able to benefit from it,” Google said in a statement. 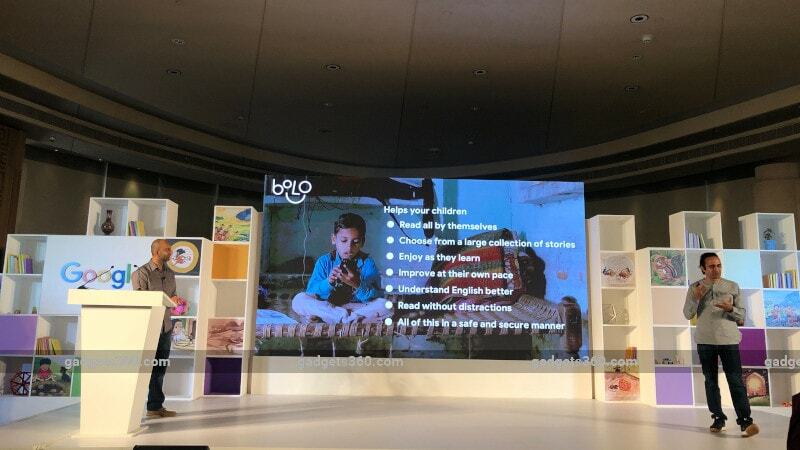 Built for native Hindi-speakers in its current avatar, the Bolo app helps the children improve their Hindi and English reading skills by encouraging them to read aloud. It comes with a large number of engaging stories, which the company hopes, will help the children in improving their comprehension skills. The app has been designed to make sure that children don't need any help in using it and can read all by themselves. Google notes that all the reading material on the app is free and it is working with other companies to bring more content to Bolo. The app relies on Google's speech recognition and text-to-speech technology. To entice the children to use the app, Google has added in-app rewards and badges to Bolo as well as word games. The company says the app includes an animated digital assistant called Diya. This assistant can read the text out loud for the children and even explain the meaning of the English text. Diya can speak English as well as Hindi, and will encourage the kids by giving them compliments when they finish a task. Further, the app can be shared among many kids and provides a personalised experience to all. So, if a family has two siblings, they can both use the app and track their individual progress. Given the app is going to be used by children, there is the important question of privacy. Google notes that it does collect images and voice data from the app but that is stored locally and is meant to help in the functioning of the application. In addition to this personal data, the search giant will also be collecting other anonymous information like device information, usage statistics, preferred language, reading and search history, and other settings. More details on Google's data collection from the Bolo app can be found on the company website. According to Google, the Bolo app is still in beta and the company will be working with its partners like Kaivalya, Room to Read, Saajha, and Pratham to further refine it and take the app to more children. The company has already carried out a controlled pilot for three months in 200 villages of Uttar Pradesh's Unnao district and it says that the initial results were encouraging. The Mountain View, California-based company also revealed that it is planning to add more features to the app, including one that can help the children improve their vocabulary. It is also working to add support for more Indic languages to Bolo, but the company did not share a timeline for the same. Bolo app can be downloaded from Google Play and works with all Android phones running KitKat or above. It comes with 16 preloaded stories and more can be downloaded. The overall size of the app is less than 50MB, which includes the speech modules and the entire experience.